As dentists, we always want to save teeth. Unfortunately, it is not always possible to save every tooth. Dental implants began to appear in the 1970’s, and thanks to advancements, our Charlottesville dentists are able to offer a reliable single or multi-tooth replacement option with great general success. It makes a wonderful alternative to a conventional bridge or denture. 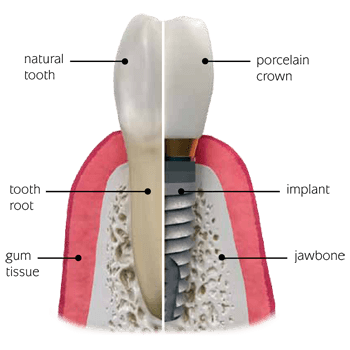 A dental implant is a titanium fixture that supports a dental crown. Dental implants have a variety of applications including the support of crowns, bridges or dentures. For those who use dentures with an adhesive to keep them in place, implants can be a great way to eliminate the use of adhesive and improve your quality of life! Why use dental implants to treat many dental problems? Dental Implants are quickly becoming the best way to treat dental problems because they stimulate the jaw naturally to prevent bone loss in the same way that natural teeth do. Crowns, bridges and dentures do not stop bone loss once a natural tooth has been removed. A dentist may also need to grind down healthy teeth for crowns and bridges, placing them at much greater risk for future problems. Dentures often become unstable and uncomfortable as you age, due to the jawbone shrinking, which can cause problems when speaking and eating. But with dental implants, healthy teeth are not ground down and this helps prevent bone loss and future dental issues. Dental implants are the new standard of care for tooth replacement. They bond with healthy bone and provide permanent support for dental crowns and dentures. Dental implants can last a lifetime and look and feel like natural teeth. A dental implant is a titanium “root” replacement used in dentistry to support dental restorations that resemble a tooth or group of teeth, replacing missing teeth. Dental implants have many uses including the ability to support a number of dental prostheses, including crowns (caps), dental implant supported bridges or dentures. Many people have dentures that require adhesive to secure them. Dental implants are a wonderful alternative and can provide a dramatic improvement in your quality of life. One of dental implants most appealing aspects is the flexibility that they allow when treating dental problems. Dental implants are the best alternative bridges and crowns. They also allow those who wear dentures more comfort and freedom. Your Charlottesville dentist can use dental implants in a variety of ways. Contact Downtown Dental to set an appointment and discover how Dental Implants could help you!